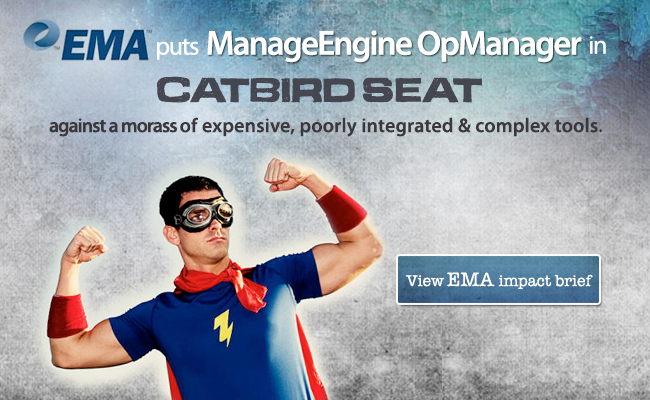 EMA puts OpManager in catbird seat against a morass of expensive & complex tools from Big4! ManageEngine continues our weekly blog series called Talk to ME Tuesday. Each week we discuss interesting topics from the world of technology with you, the people that live and breathe it everyday. ManageEngine: Thank you Network World for listing ME as “Product of the week”. A recent study on what business enterprises expect from a performance management system, has shown that of IT professionals are looking for a solution that offers integrated performance management of both, the physical and the virtual IT infrastructure.